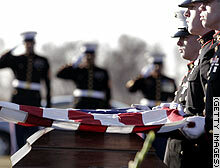 (CNN) -- The U.S. military on Sunday announced its 3,000th fatality from the Iraq war. The identity of the 3,000th military death could not be precisely determined as the exact times of deaths late last week were not immediately available. On Monday, the military said two soldiers were killed Sunday in an explosion in Iraq's Diyala province, north of Baghdad, bringing the death toll to 3,002. The U.S. military death toll includes seven civilians working for the Department of Defense. More than 22,000 other U.S. troops have been wounded in Iraq since the war began nearly four years ago. The war has also claimed the lives of about 250 allied troops, more than half of them British. Estimates of Iraqi dead range from about 50,000 to several hundred thousand. Bush vowed that Americans killed in Iraq will not have died in vain, the White House announced Sunday. "The hardest decision the president ever has to make is to send our men and women into harm's way," White House deputy spokesman Scott Stanzel said in a statement released Sunday. "The president believes that every life is precious and grieves for each one that is lost. He will ensure their sacrifice was not made in vain." Bush initially argued the U.S.-led invasion was necessary to strip Hussein's government of stockpiles of chemical and biological weapons and to halt efforts to develop a nuclear bomb -- programs Baghdad had been required to give up after the 1991 Persian Gulf war. U.S. inspectors later determined Iraq had dismantled its weapons programs during the 1990s, though its leaders had tried to conceal some weapons-related research from the United Nations. Now, the administration says U.S. troops must remain in Iraq to protect the country's new government from a persistent insurgency and a wave of sectarian violence, which has raged for most of the past year. Bush has repeatedly called Iraq the "central front" in the war on terrorism, which began after the al Qaeda terrorist network's 2001 attacks on New York and Washington. "We will be fighting violent jihadists for peace and security of the civilized world for years to come," Stanzel said. "The brave men and women of the U.S. military are fighting extremists in order to stop them from attacking on our soil again." The U.S.-led war in Afghanistan, where remnants of al Qaeda and its Taliban allies are battling U.S. and NATO troops five years after the attacks, has claimed 353 American and 156 allied lives. The independent commission that investigated the 9/11 attacks found no "credible evidence" that Iraq had aided al Qaeda in the attacks, which killed 2,749 people. But Islamic militants loyal to al Qaeda have joined the insurgency against American troops in Iraq and have launched numerous attacks on Iraqi civilians since the fall of Baghdad. Observers say improvements in body armor and battlefield medicine have helped limit the death toll. The war in Iraq has now lasted longer than U.S. involvement in World War II, which claimed more than 405,000 U.S. military lives as the United States and its allies battled Germany, Japan and Italy. Lance Cpl. Beeler was killed in action December 7 while conducting combat operations in Anbar province, Iraq.